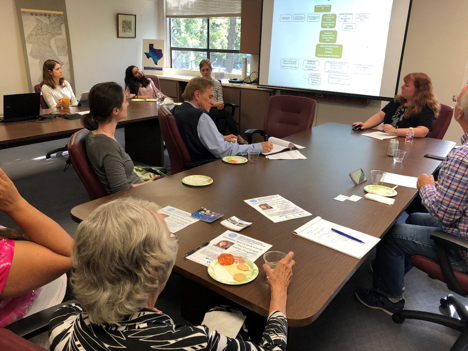 The Texas International Education Consortium invited Ms. Karen Hawkins, director of the Office for Private Sector Exchange Designation, to TIEC headquarters on April 18 and 19, 2018, to speak about The U.S. Exchange Visitor Program and discuss opportunities for Non-USG entities to host their own international exchange programs. “The biggest perk of bringing international students to the U.S. under a J-1 visa is that it allows for academic training and internships,” said TIEC President Robin Lerner, who herself used to oversee the J-1 visa program during her time at the State Department. She explained that as an organization, TIEC was able to sponsor J-1 visas to students. The program dates back to 1940, when Nelson Rockefeller fostered an exchange to bring 130 Latin American journalists to the United States. According to Ms. Hawkins, today, 315,000 people come to America every year through the J-1 Exchange Program with the U.S. State Department. Ms. Hawkins says that millions of foreign nationals have come to the U.S. for a cultural exchange since the birth of the program. Find out more about the U.S. Cultural Exchange Visitor Program by visiting j1visa.state.gov.